The newest State Capitol exhibit, Lines on the Land, celebrates both the art and science of land surveying as practiced in Arkansas for almost 200 years. 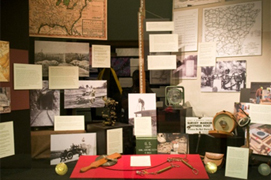 The exhibit features images from the archives of the National Geodetic Survey’s archives, plus a generous selection of surveyors’ equipment, both vintage and modern. Lines on the Land demonstrates that while the profession’s tools and, to some degree, techniques have changed, its emphasis on accuracy and precision has remained constant. The exhibit coincides with the rededication of the state’s Zero Milestone, a marker installed on the Capitol’s east Promenade in 1932 to promote state highway construction. The milestone was removed several years ago after an act of vandalism. 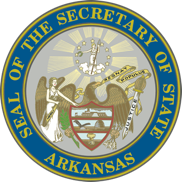 The state’s surveyors relocated it, with the consent of the Secretary of State’s office, to the grounds of the Arkansas Board of Registration for Professional Engineers and Land Surveyors across from the Capitol grounds. Lines on the Land has been prepared with the assistance of the U.S. Department of Commerce/National Oceanic and Atmospheric Administration/National Geodetic Survey, the U.S. Department of Transportation/ Federal Highway Administration, the Pulaski County Public Works Department, the Arkansas Department of Agriculture/State Land Surveyor’s Office and private collectors. 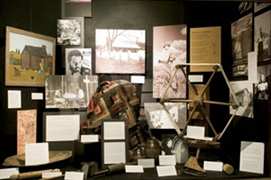 The newest State Capitol exhibit, Arkansas Folk, features the folk culture of the Ozark highlands of Northern Arkansas as preserved by the Ozark Folk Center. Located near Mountain View in Stone County, the Ozark Folk Center was established in 1973 to preserve the traditional arts, trades, and the popular culture of the hill country. 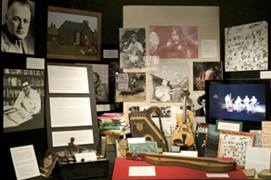 This exhibit—which includes handicrafts and musical instruments along with photographs, videos and music—highlights the rich legacy of the Ozark Folk Center and its research collections, now part of the state archives. 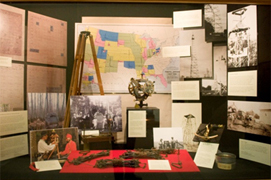 A collaboration between the History Commission and the Secretary of State’s office, the exhibit affords Capitol visitors a sampler of Ozark folk life, as well as glimpses of the History Commission’s other holdings related to Arkansans’ traditional crafts and ways of life.